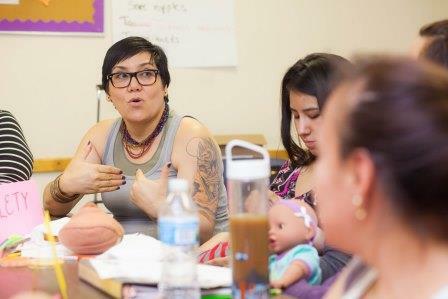 CHICAGO, IL – HealthConnect One of Chicago, Illinois, will amplify the voice of communities of color in maternal and child health/breastfeeding decision-making, by developing effective and authentic community leadership and by organizing a coordinated national network. The three-year project is funded by a grant from the W.K. Kellogg Foundation of Battle Creek, Michigan. At the end of three years of successful work, HealthConnect One will have enriched the conversation around birth in this country and brought the maternal and child health world closer to equitable compensation for community-based doulas and community health workers. The project will develop grassroots leadership that will impact communities’ capacity to analyze and understand maternal and child health issues. Through HealthConnect One’s Leadership Academy, participants will engage in a ‘story collection’ initiative, sharing their challenges and triumphs so as to amplify diverse voices and change perceptions. HealthConnect One will also partner with communities to conduct field-based innovation for grassroots community organizing. HealthConnect One® transforms how babies are born and cared for in their first months of life. Understanding that community members are the best experts on their families and neighborhoods, HealthConnect One takes a collaborative approach to each program and initiative, partnering with people of color and low-income communities across the country to ensure support for parents and babies in every part of their lives. For more information, visit www.healthconnectone.org. The Kellogg Foundation is based in Battle Creek, Michigan and works throughout the United States and internationally, as well as with sovereign tribes. Special emphasis is paid to priority places where there are high concentrations of poverty and where children face significant barriers to success. WKKF priority places in the U.S. are Michigan, Mississippi, New Mexico, and New Orleans; and internationally, are in Mexico and Haiti. For more information, visit www.wkkf.org.